I went to the post office to mail my tax returns yesterday. While the postal clerk was placing the certified mail stickers and printing the receipt, I noticed a printout under the glass on the counter. The title the page said FY 2009 Mystery Shop Script. It’s the instructions to the clerks for what they are supposed to say to a customer. It starts with offering Express Mail. We can get it there the next day for $17.50. It includes $100 of insurance. Not the exact words, but something to that effect. It continues with suggesting the next most expensive service, and the next one, followed by the optional insurance, return receipt, delivery confirmation, and so on. Whoa Nelly! While I’m used to being pestered about extended warranties at electronics stores, I did not expect a government-run postal service would train its employees to extract the maximum amount of money from the customers with unnecessary services. It’s been like that for some time. Whenever I try to mail something, the clerk always practices the friendly power of suggestion for some service upgrade. They do it by scaring you about the possible slow delivery time of their regular service. I suspected something was going on but seeing the script this time really made me sick. PAUSE AND WAIT FOR CUSTOMER TO RESPOND before offering any other classes of mail! Note: Hierarchy of offering classes of mail MUST BE IN THIS ORDER — Express Mail, Priority Mail, First-Class and then if needed Parcel Post. Parcel Post should never be offered unless all other options have been declined by the customer. I found the script on a forum where postal employees discuss things. I learned that Mystery Shop aka Mystery Shopper is a program run by the USPS. Third-party auditors come to the post office pretending to be customers. The clerks are evaluated on how they perform their upselling. If they don’t follow the script, they will get poor scores. They will get into trouble with their postmaster. 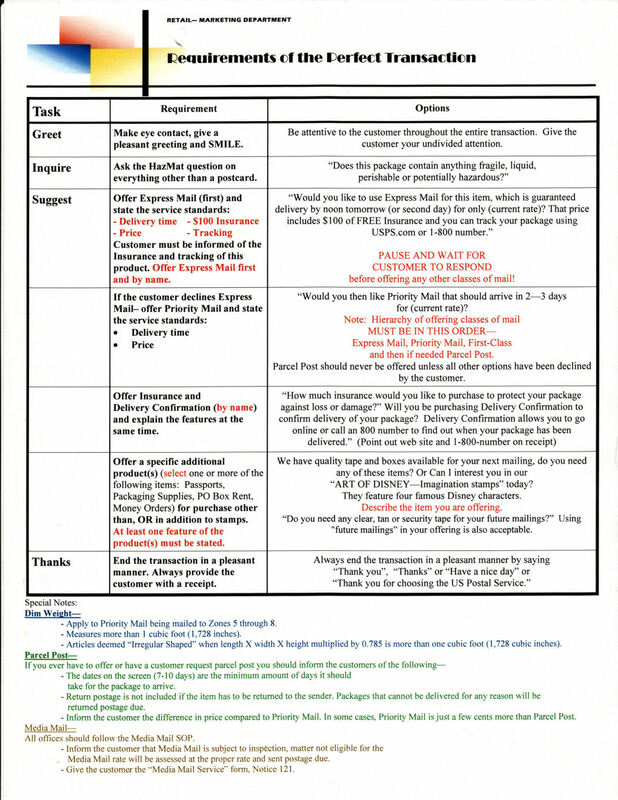 If a station doesn’t perform well in these Mystery Shopper audits, the postmaster gets into trouble. I’m a regular at my local post office and there is one teller there that always does this and it makes me crazy. But I didn’t know that they were actually trained to do it. I feel like he is trying to rip me off. I try to avoid that teller when at all possible. No other tellers there do that. They just display all the options on the little screen I pick which one I want. My local office doesn’t do this but it’s just one guy. The office downtown is really bad though. We have to go through each one before we finally get to the cheapest ones. I vote we break them up and regulate usps like a utility. This bothers me, too, but you have to remember that the Postal Service is not a “government-run” entity. They are a government-owned corporation (I am not sure what the exact nomenclature is), are expected to break even over the long run, and are not funded by taxpayer dollars. They also are losing money (billions) as people stop using letter mail in favor of email and electronic bill paying. So, unfortunately, they apparently are adopting the tactics of other corporations that try to get you to “supersize” your meal or at least order fries with your hamburger, or buy the bigger TV, or get the premium channels. I don’t like it either, and it may come as a surprise that caveat emptor applies to the Postal Service as well as the local fast food joint, but I guess it’s what happens when an entity is fighting for survival. The USPS web-site isn’t a whole better in this regard. I recently had the occasion to send a regularly-sized letter from the US to Canada. The USPS web-site’s lowest quoted option is above $10 (Express Mail). I called the postal service hotline, and learned that a 96 cent stamp was all that was needed. I was in NYC on biz, and decided to visit the main post office to purchase and mail the letter. Net = the actual price was 72 cents. Ignorance was definitely in play, here, but, I can’t help but get annoyed by the USPS web-site not even offering a reasonably priced option. @the weakonomist: in the age of proven private delivery business models and electronic documents, remind me again why do we need a government-run or even “utility-like” postal service? Just allow any private company to deliver mail, sell USPS to private investors (ok, maybe break it up first), and let it compete with UPS and Fedex. No utility-like regulation required. I don’t know ALL the restrictions on the USPS, but I did consulting work for them for about three years. They ARE on their own, in that they have to break even over time (though the feds will lend them money if they get into too much financial trouble). They are not bound to many of the regulations governing most government agencies, such as the Federal Acquisition Regulations. And they really do think unlike any other government agency I have ever consulted to – much more like a corporation (they call themselves a corporation, have vice presidents rather than assistant secretaries or commissioners, enter into partnerships with other corporations, and worry about their competitors). But again, I don’t claim to know all the details. Bottom line is that they ACT like a typical American COMPANY – trying to find a way to get you to buy more of their product. They worry about marketing, trying to improve customer service, making Post Offices more attractive, reducing costs, making their competitors look bad, and, unfortunately, upselling. @dont care no mo’ on: You might feel like that if you are from an urban area. But delivery and service by the private companies is a lot less “proven” for rural customers. Personally, I would not give up my USPS, because where I live there are no serious competitors. If I am sending anything priority, I just use the postal website. It gives you free delivery confirmation, no hassles from clerks, and best of all, I print it out, tape it to the box and walk past the 25 people in line and drop off the package at the front. @Don: Yes, some products and services are cheaper or better quality for me because of market density. But you live in a house on a piece of land the size of a sports field, while I cram into a small apartment with no parking and an extra fee for pets. No one forces either of us to live where we live, we look at the trade-offs and make our choices. Then how is it fair that I am forced to subsidize some of those products and services for you? Maybe you can pay part of my rent so that I can move to a building with an elevator and don’t need to walk up 4 floors? @Jim: even if it competes with private companies, USPS still has uncompetitive advantages. It doesn’t answer to shareholders. The feds will lend it money, but probably at better-than-market rates, and anyway a loan that you know will not be repaid is not really a loan, but a giveaway. What will happen to USPS if it cannot repay its debts? Can it go through bankruptcy? In my mind, the difference between USPS and Amtrak is of appearance and legal language, not of substance. BTW, Amtrak advertises too, just saw its ads on the TV. This script is a load of crap invented by a pencil pusher to justify their job. The post office needs to dump the script, let the managers actually manage, leave the clerks alone, and drop the mystery shopper program altogether. This script is used as a tool upper management who have no idea what the actual work entails. It borders on harassment and deters repeat customers, rather than enhancing the customer experience!! As for the aforementioned clerk who always does this, they are the one who is doing what they are supposed to do. The others, if found not following the script, will be disciplined for not following it if they are mystery shopped. This misdirected program is one of the many reasons that the post office is operating in a deficit. And the powers that be wonder how to cut costs!!!!!! the mystery shopper program is a big joke. It is awful to have to say that to each and every customer. Iam a clerk and I HATE it but if I don’t do it I will get written up and I can’t afford to lose my job. I wish someone in power would have some common sense and realize this is only harrassment to our customers and I am very knowlegeble about what the customer needs and let me help the customer and don’t give me a script that at times doesn’t even make sense for what the customer is saying.